Symone Abbott prepares for a spike. 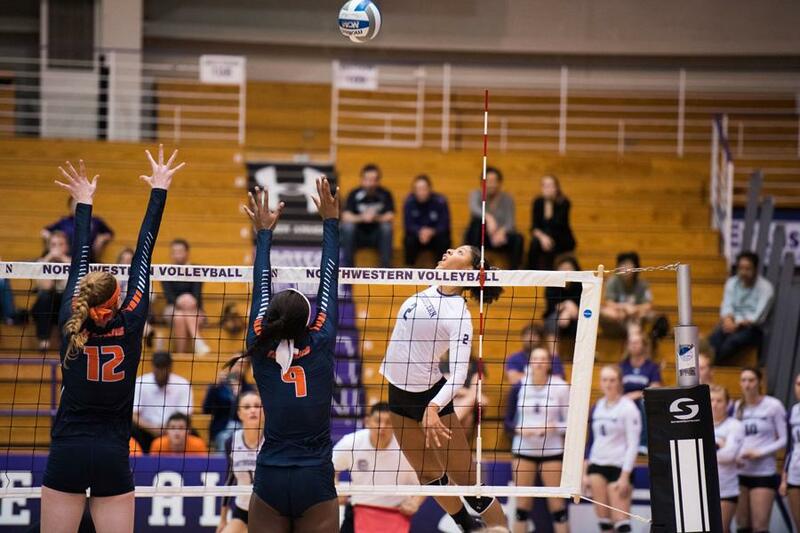 The junior finished with 46 kills over the course of the UNI Tournament this weekend. It was another up-and-down weekend for Northwestern in their final non-conference tournament of the season. With Big Ten play on the horizon, the Wildcats (7-5) competed in the UNI Tournament over the weekend, defeating North Dakota State (2-11) and Syracuse (1-9) on the opening day of competition Friday before falling to tournament host Northern Iowa (9-5) on Saturday. “We didn’t execute the way that I feel like we should have, but I think 2-1 is a fine way to come out of a (non-conference) tournament,” junior outside hitter Symone Abbott said of the Cats’ weekend in Iowa. Abbott led the tournament in total kills with 46 over the two-day event. She tallied 16 in NU’s four-set Friday victory over the Bisons and followed that up with a 14-kill, 18-dig performance in a five-set win over the Orange later that day. Coach Shane Davis said he was impressed with Abbott’s willingness to adapt to the team’s needs. Despite Abbott’s strong play, NU couldn’t pull out an undefeated weekend at the tournament. The Cats fell to the Panthers in straight sets on the second day of the tournament. Abbott once again led NU’s efforts with 16 kills and seven digs. Senior setter Caleigh Ryan had 12 assists in the match, while junior setter Taylor Tashima added 20 assists. Ryan said that the team struggled to carry out its game plan in the loss to the Panthers. Davis noted his team’s resilience against strong competition so far this season but also acknowledged the need for the Cats to take their game to the next level. NU has played power conference teams such as Virginia, Ole Miss, Xavier and Virginia Tech in its non-conference schedule. Davis said he feels the slate has prepared the Cats for competition in the Big Ten, a conference that currently has eight teams ranked in the top 25 and three ranked in the top 10. NU begins Big Ten play on Wednesday against Indiana. As one of the leaders of the team, Abbott recognizes the significance of the match.